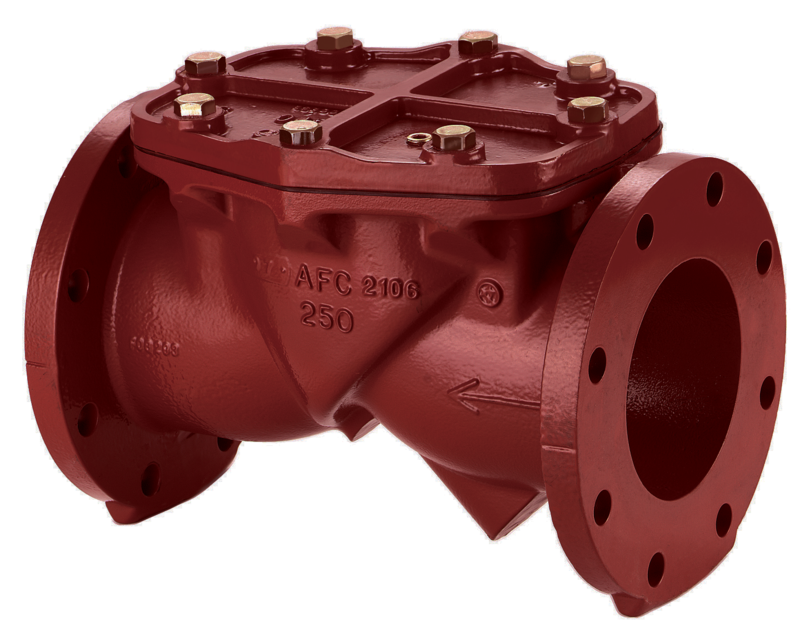 The AMERICAN Series 2100 resilient seated check valve is simple, durable and exhibits improved design features over that of traditional metal-seated swing check valves. The Series 2100 features a light weight ductile iron body and bonnet. Both components are coated with a fusion bonded epoxy prior to assembly. The valve is held together with Type 304 stainless steel fasteners. Due to the addition of magnesium in the iron chemistry, ductile iron has more than twice the tensile strength of gray cast iron. The check valve fully complies with ANSI/AWWA C508 and has been Certified to NSF/ANSI 61 and NSF/ANSI 372, demonstrating compliance to the U.S. Safe Drinking Water Act (SDWA). The disc is also made of ductile iron and is secured with nylon reinforcement to a stainless steel shaft. The disc and shaft are fully encapsulated with EPDM rubber to create the valve’s only moving part. The Series 2100 is rated for 250 psig. The valve seals with zero leakage at pressures above 5 psig. In flow conditions the waterway is unobstructed. The valve is designed to minimize disc slam. Due to the unique geometry of the valve, the disc only has to travel 35-degrees from a full open position to fully closed, as compared to a 90-degree travel in most traditional check valves. This allows the valve to close before the flow of the fluid is reversed. There is only one moving part in the valve, thus minimizing maintenance. Although unlikely, should the disc be damaged its symmetrical design allows the disc to be reversed so the valve can be put back into immediate service. An optional backflushing actuator can also be furnished. In addition to backflushing, the actuator is also useful for helping prime problematic pumps. The tapped port location the actuator resides in can be used to help drain lines or facilitate system testing.